Addis Ababa, meaning New Flower in Amharic is the capital city of Ethiopia. Situated at an altitude of over 8000 ft, it is the third highest city in the world. The temperature is very mild and remains constant due to its proximity to the equator and altitude with lows and highs ranging between 50°F and 71°F. The population of Addis is approximately 5 million people and more than 80% of its residents are Orthodox Christians. There are more than 70 languages spoken in Ethiopia, but Amharic is the official language. English is also widely spoken. Addis Ababa, founded by Emperor Menelik in 1887, is an area rich in places of interest and is situated in the center of the country. There are over 100 international missions and embassies located in Addis making the city a hub for diplomacy concerning Africa. The headquarters for the African Union and the United Nations Economic Commission for Africa can both be found in the city. The United States and the European Union have two delegations in Addis, one for bilateral relations with Ethiopia and one for relations with the African Union. Addis Ababa is vibrant with a growing population of young educated professionals and creative people. The constant flux is apparent everywhere. This is partially due to the large influx of Ethiopians returnees bringing with them the influences and experiences from America and other western countries. It is also influenced by the large number of foreigners who make Addis Ababa their home. Walking in Addis is very pleasant, but my first few days in the city proved to be overwhelming because of the multitude of child beggars, disabled, pick pockets, con artists, hawkers and taxi drivers all clamoring for your attention. Walking in this city is like weaving; you must weave through traffic, most of the time, without traffic lights, dashing across busy intersections among a sea of humanity, taxis, passenger mini vans, buses, cows, oxen, sheep, donkeys, and stray dogs. The enormous amount of people in the streets reminded me of people fleeing from the 9/11 attacks in New York City. By the end of my first few days, I felt besieged, but I quickly learned to ignored them all and move swiftly through the streets like a local. Every imaginable spectacle can be seen in Addis, from First World Luxury to Third World Poverty. It is not uncommon to see shacks next to huge modern international hotels. In fact, across the street from the very elegant Sheraton Addis Hotel, I saw a man dragging his goat on his hind legs in heavy downpour. In the central business district, homeless women and children sit beside gutters of the busy streets begging for food or money. In the upscale Bole’ district, beautiful women dressed in high heels, tight jeans and hoop earrings can be seen picking their way through the traffic, on the wet and muddy sidewalks. Despite all these unsavory distractions violent crime is virtually unheard of in Ethiopia, and the crime rate for serious crimes is very low compared to other African countries. Overall Addis Ababa is a very busy, bustling and exciting city with amazingly beautiful women and well dressed men. The majority of people are friendly; men, women and children are eager to practice their English. 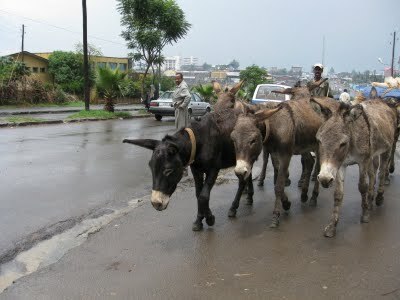 Although Addis Ababa is a relatively modern city, the surrounding areas are steeped in an ancient and foreign culture. Stay tuned as I reveal more of the mysteries of Ethiopia. CONSORTIUM FOR BELIZEAN DEVELOPMENT, INC.